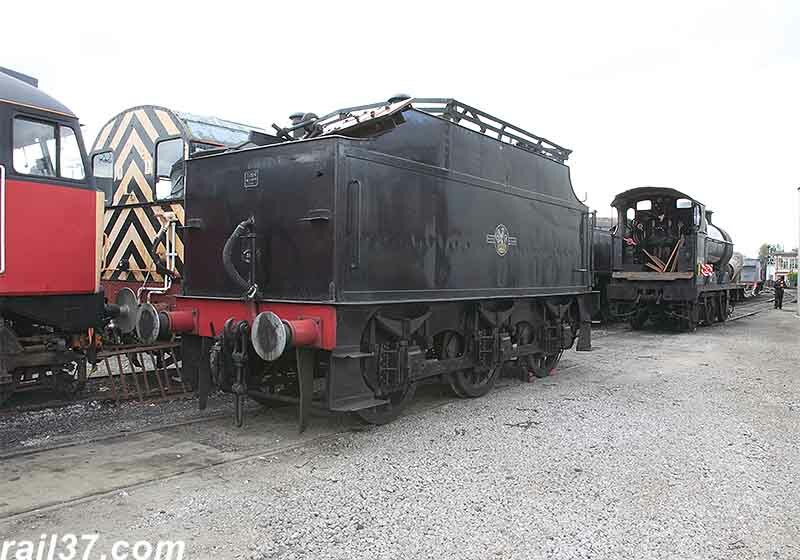 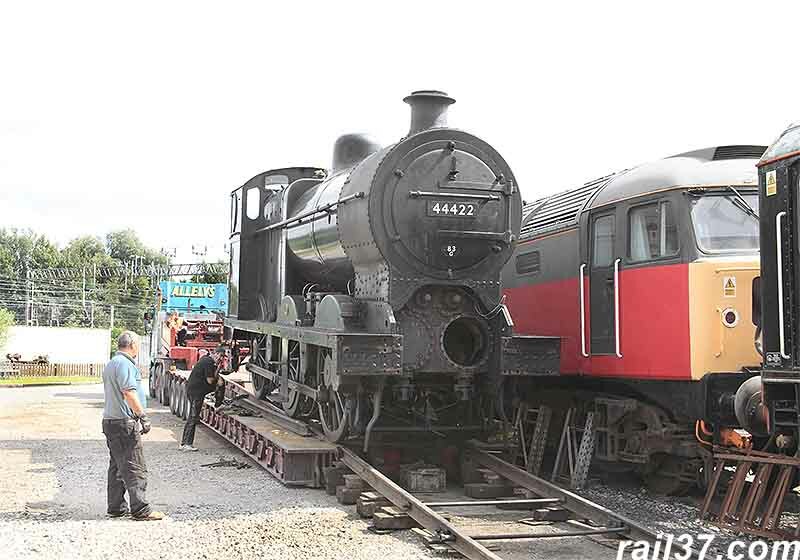 I went to the LNWR Heritage workshops to await the arrival of 44422 which was being brought in for repairs after priming had caused damage to various components. 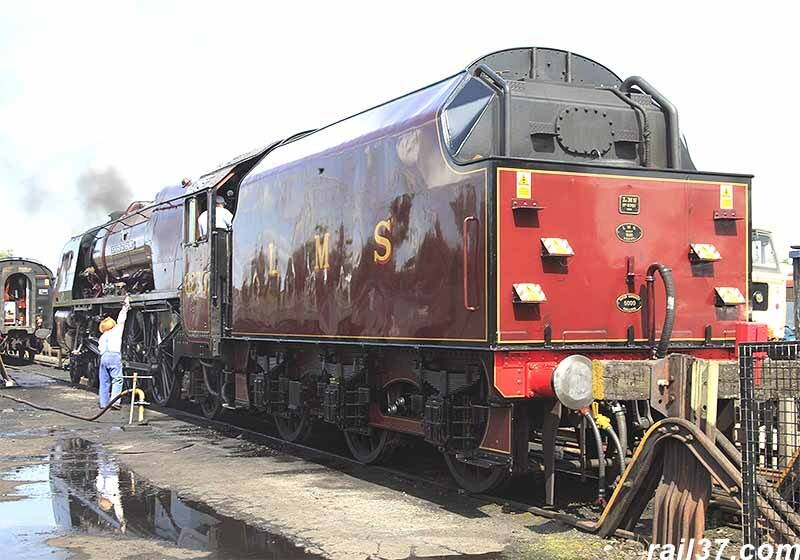 Whilst awaiting the arrival I was pleased to see 6233 "Duchess of Sutherland" being prepared for a run out the following day. 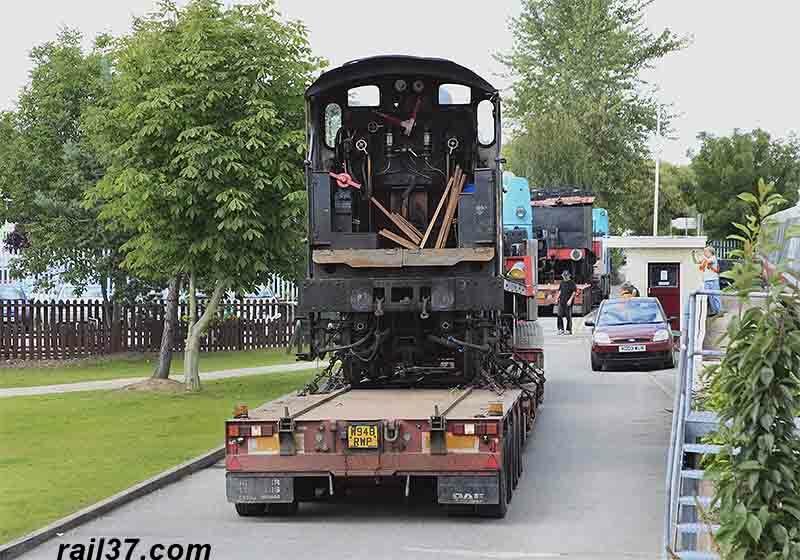 Eventually the entourage arrived and both vehicles were reversed into the LNWR premises - it takes some skill to reverse those things through the narrow gates bearing in mind they also had to negotiate the main entrance to a Tesco store complete with its constant traffic movement! 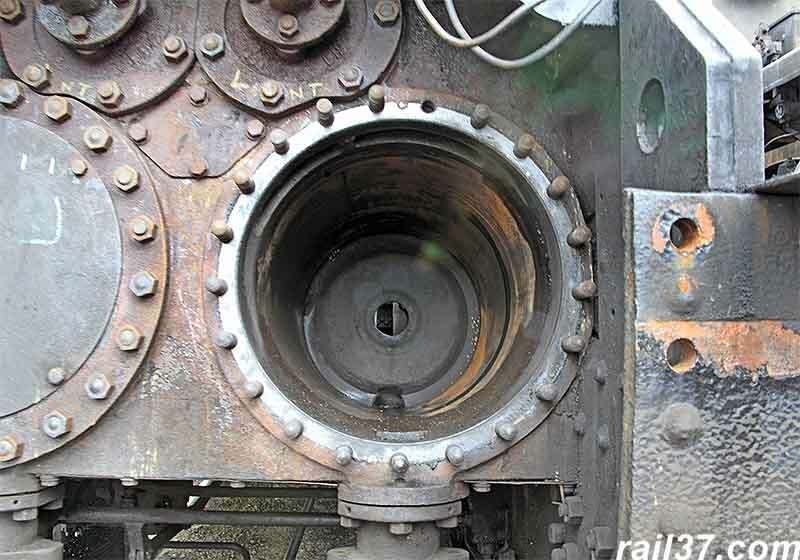 As the locomotive passed by I could see the buffer beam had been removed and the gaping cylinder bore. 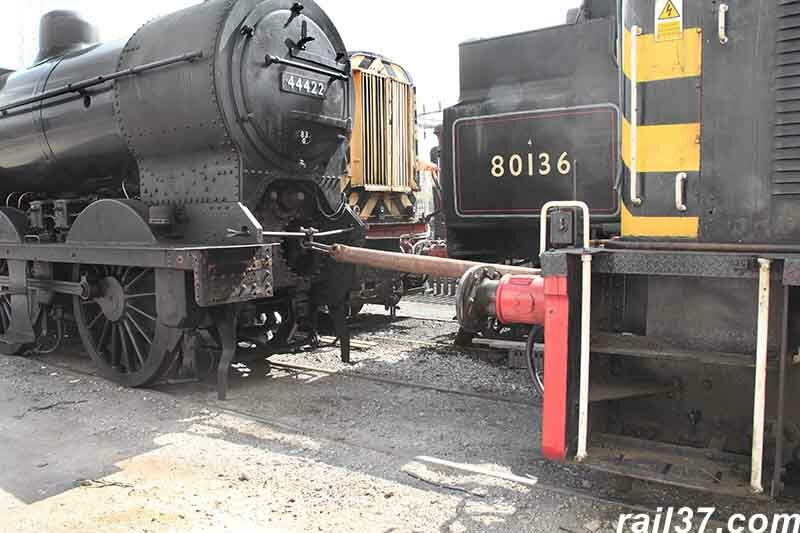 The engine was positioned to be lowered onto the accommodation track. 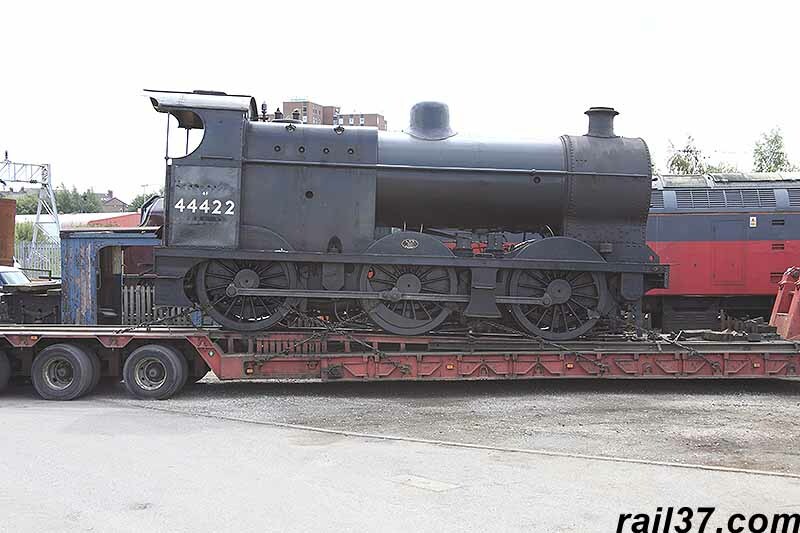 44422 is now on the end of a steel cable attached to the trailer's winch unit and is allowed to travel down the ramp under gravity. 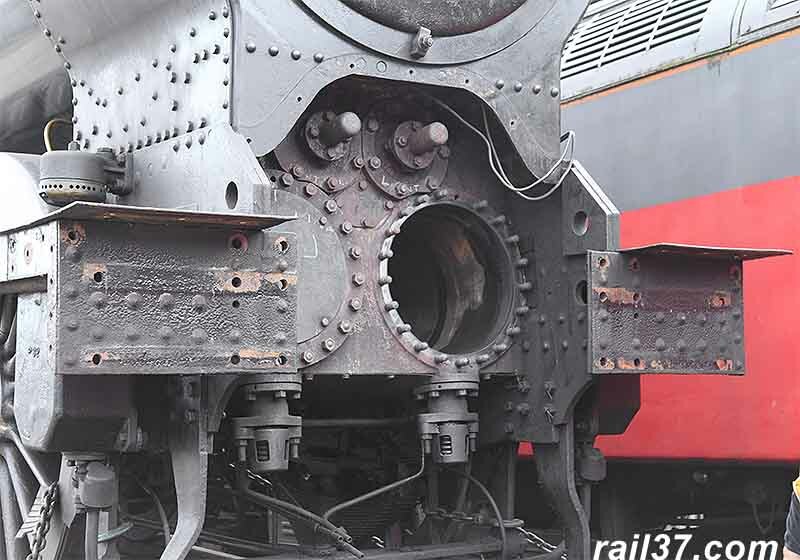 However, nothing is simple and, as the engine became supported by the front and rear driving wheels, the centre axle dropped into the gap and the wheels locked onto the brake blocks. 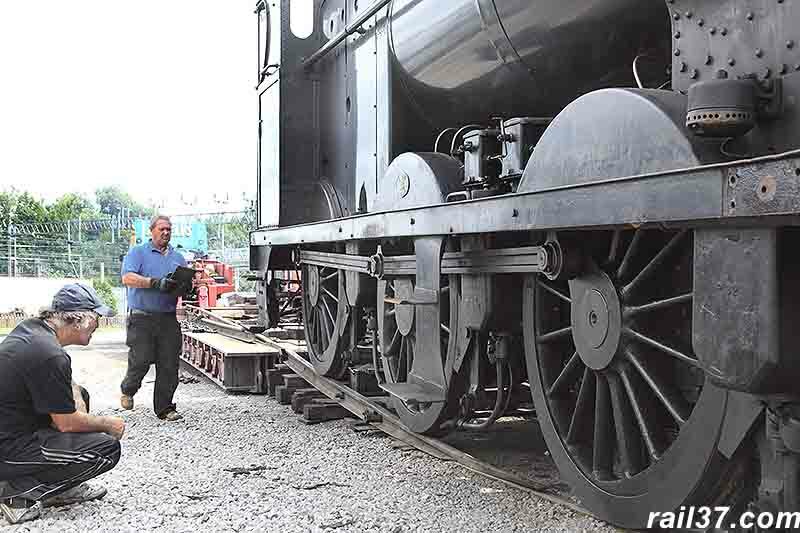 Note the rear section con rod out of alignment because of the centre axle movement. 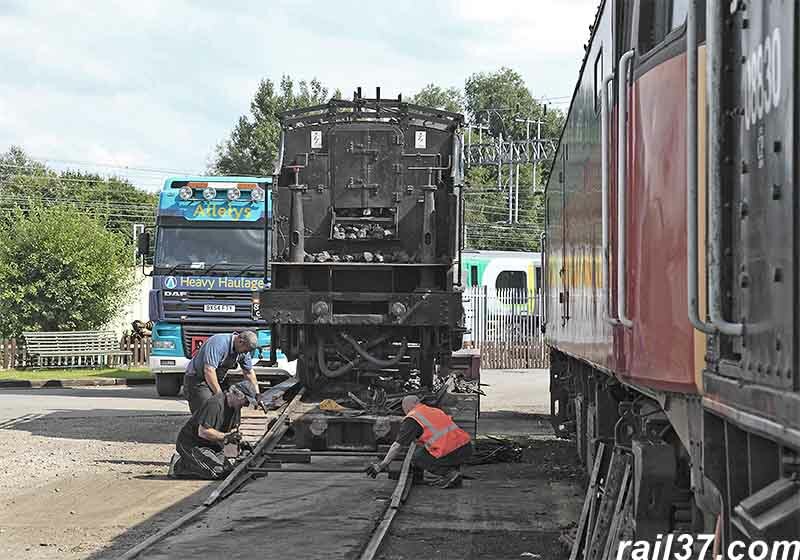 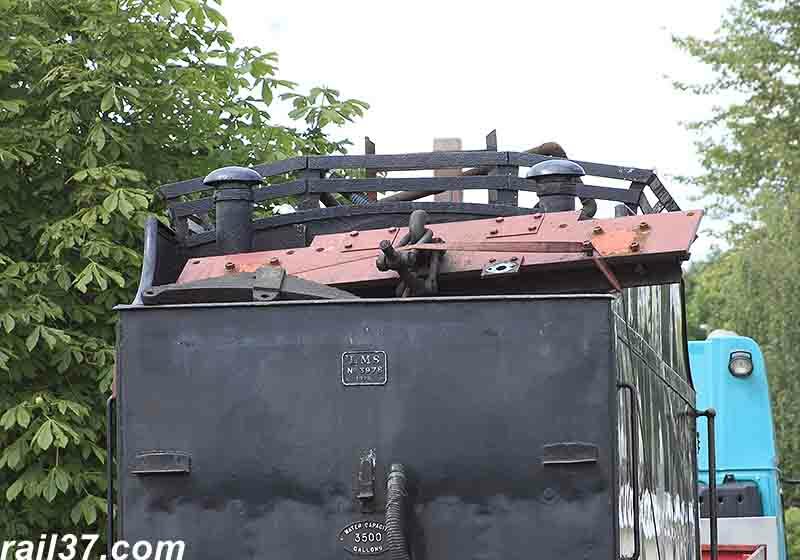 A gentle tug from the site diesel combined with a few skilful tricks known to the Allely's staff, and the 4F was soon off the trailer. 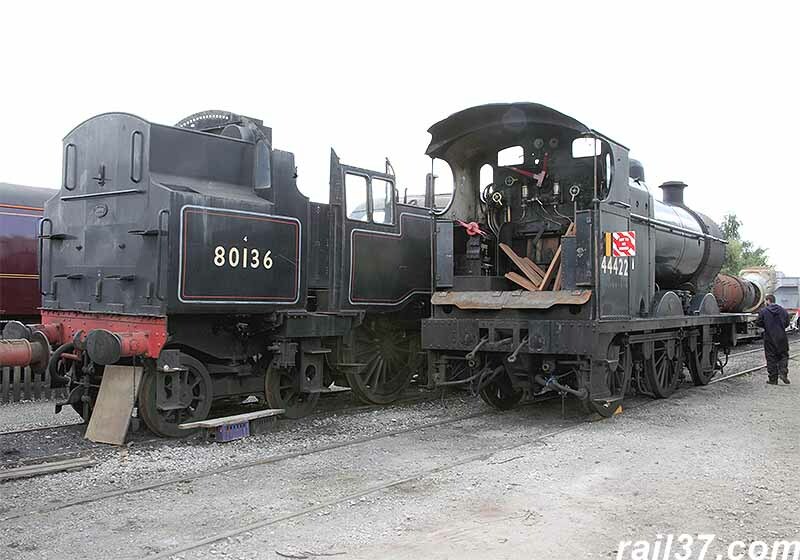 It was then manoeuvred up alongside 80136, currently in the workshops for its 10 year overhaul. 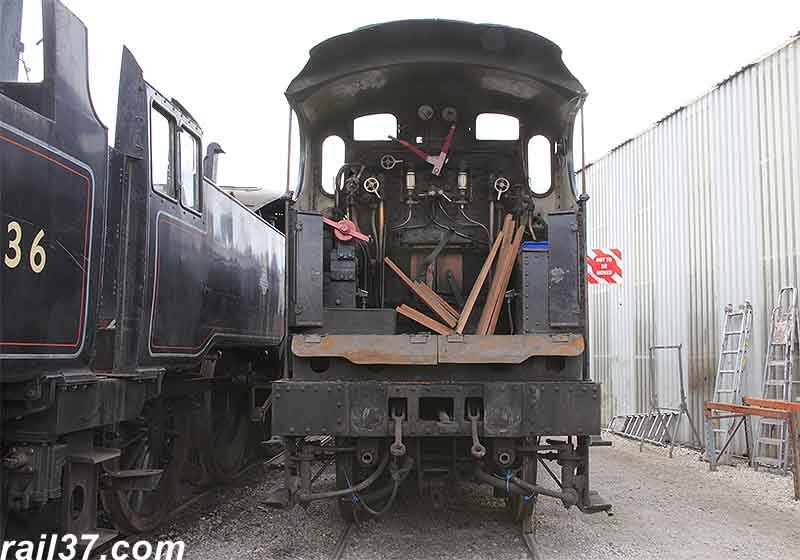 On the footplate were the timber pieces bought in to replace the cab floor. 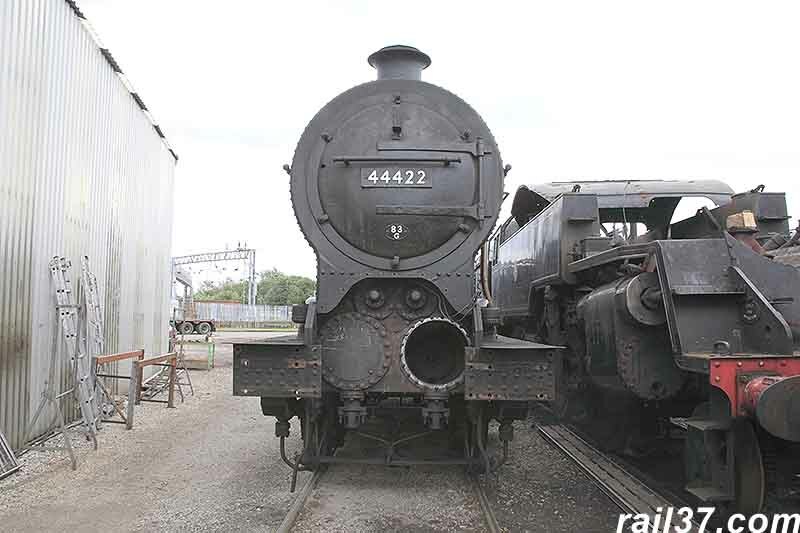 44422 looking very sorry for itself. 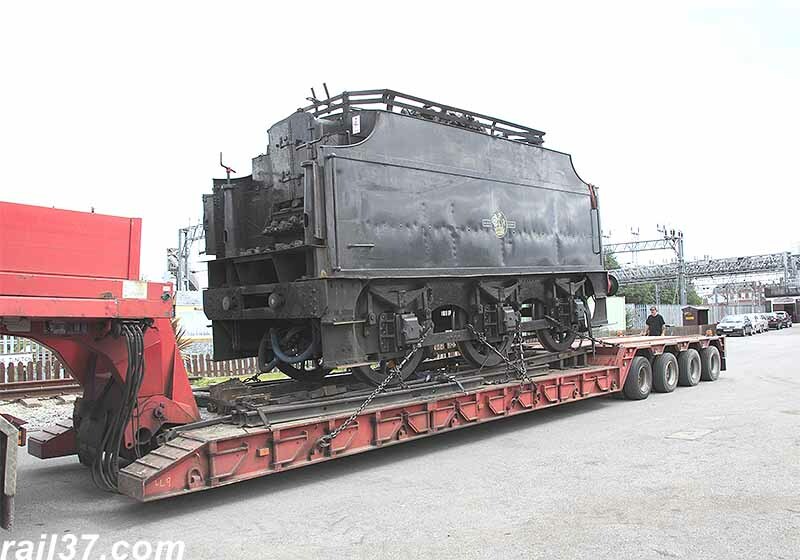 Now it was the tender's turn to be dropped off the trailer. 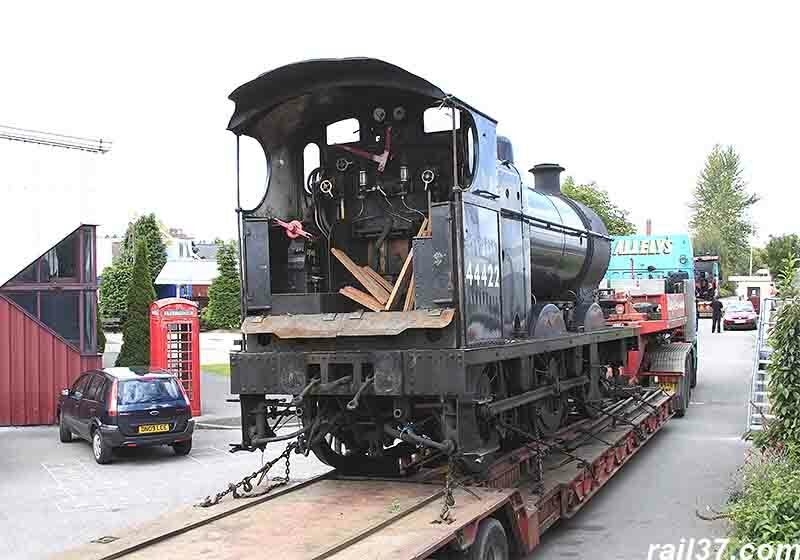 .....and this time there was no need for assistance because the tender ran straight down the ramp to join the engine. 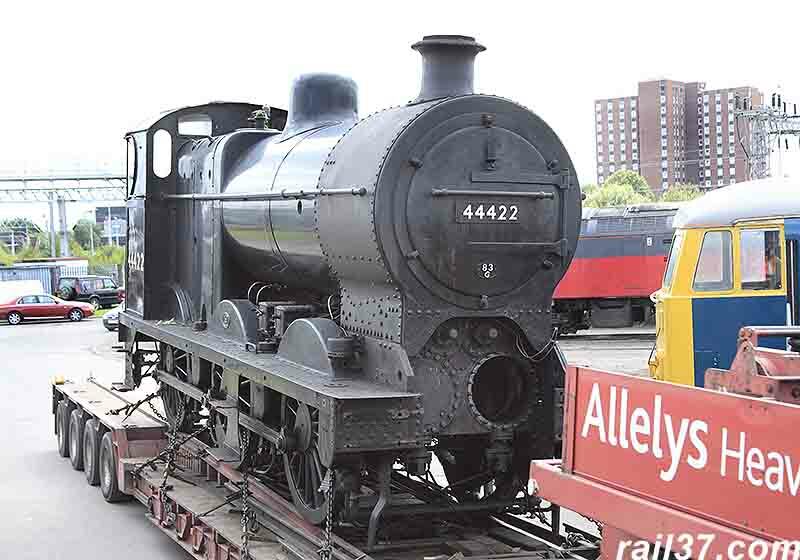 A job well done, as ever, by both Allely's and LNWR Heritage staff combined.